The Newsboys are made up of Duncan Phillips, Jeff Frankenstein, Jody Davis, Peter Furler, and Phil Joel. In the past 12 years, the Nashville-based quintet has become one of pop's most solidly accomplished ensembles, selling nearly three million records, earning three Grammy nominations, three gold records, four Dove awards, and numerous other accolades. Their blend of polished, energetic songcraft, and resonant lyrical themes have resulted in meaningful music that engages the ears and the soul. Dove Award, Rock Album of the Year, 1995, Going Public. The band with the #1 selling artist worship album of 2003 (ADORATION) is in for a very, very busy February. On the morning of Tuesday, February 3, Newsboys lead singer Peter Furler will conduct live radio interviews with stations all over the United States, giving listeners a hint about what to expect when the band's upcoming concert tour comes to their town. The band from Down Under is still on top. R&R magazine has ranked Newsboys' "He Reigns" as the #1 Christian radio single of 2003 while CCM magazine readers have voted the quintet "Artist of the Year" in the January 2004 issue. The band's ADORATION tour begins next month. Newsboys ADORATION tour kicks off February 12 and runs through April 4 with very special guests Rebecca St. James and Jeremy Camp. Each show will feature separate sets from each artist as well as a time of corporate worship. Congratulations Newsboys! ADORATION is honored At Retailers Choice Awards. ADORATION. Book and music store employees from around the United States have named the project "Best Album" in the 2004 Retailers Choice Awards sponsored by Christian Retailing magazine. The awards were handed out last week in Atlanta during the annual Christian Booksellers Association International convention. On devotion, Newsboys embrace the congregational and community aspects of worship, and enlisted a true community of artists to help create the album - with guest appearances and collaborations with Rebecca St. James, Tim Hughes, Delirious' Stu G., and more. Devotion picks up where Adoration ended, continuing the worship experience with songs including "Presence", "Strong Tower", and more. They bring their faith to life. They care about their fans by not putting bad things in their music. My family is sick of hearing about them. So are my friends. I've been to 2 concerts and the ends are pure worship.They don't take the glory. They leave quietly, reminding us that our focus should be on God. They are my favorite band not only cuz they are awsome and the tightest band but cuz they're songs give out a message for Christ. Because of them I'm saved. I owe them everything. I love u guys. 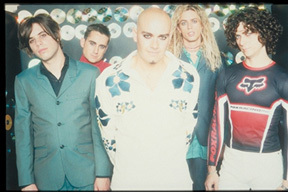 And besides, Peter Furler is hot :)! I have every record they have come out with so far, including the singles, at least 3 posters from every tour, a pick Peter threw in the crowd at one of their concerts, an autographed pick Phil threw in the crowd at another concert, and a lot of autographed CD slips(the whole band). And I have the best thing that no other fan could ever have! A shirt that was once actually Peter Furler's! Oi yeah! As you can see, I'm a huge fan...... Anyways, these guys live for God, and you can see the fruits in their lifes and their music.They inspire, and they rule!! Keep going, OiBoyz! Hey, I recently saw the Newsboys in concert at Loon Mtn., NH (at the Inside Out Soul Festival) and they put on one heck of a great show. I also saw them last year, same place as well. It was a wonderful sight...seeing all the people they drew, stand or sit and listen and sing along to their God-glorifying music. What a wonderful time it was! I love listening to the Newsboys' music. The lyrics are so powerful if you really concentrate on what they are saying. I am listening to their "Step Up To The Microphone" CD as I type this. I just wanted to say that they are great and I am thankful for their music. It is amazing! Thank you. God Bless! The Newsboys are the best christian band ever. My favorite songs are ''Step up to the Microphone'' "Entertaining Angles", "Woo Hoo", "Beautiful Sound", "Everyone's Someone", and Breakfast". 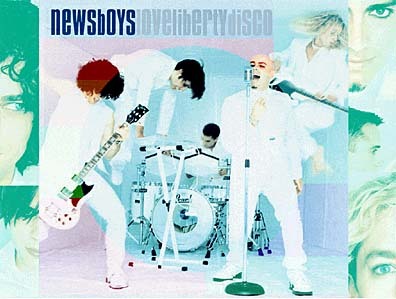 The CD's I have are Step up to the Microphone and Love Liberty Disco.You guys rock Newsboys!!!!!!!!! The Newsboys are my favorite band because of the songs that they sing especially "Entertaining Angels" and because they gave me a chance to go on a mission trip that I might not have gotten to go on, if they hadn't said anything. By mentioning Teen Mania and their missions and singing the songs that they sing it also put God back into my heart where He needed to be. The Newsboys in my opinion are the best Christian Group I have ever heard, their music is trendy and catches the ears of the young and old, Christians and non-Christians alike. If anyone can bring a person to God through music, it's the newsboys - keep spreading the truth through your songs guys! The last two albums are ace! I wait in anticipation for their next release - keep up the good work! About two years ago I went to a retreat that changed my life. It was a Franklin Graham festival with Newsboys in concert that night. It was awsome! Later about a year later I went back to a Newsboys concert, hey it was even better! But, although Newsboys is an awesome group they are my second. My first is dc Talk! I just recently went to their Supernatural concert! Wow! that was awsome, anytime if I had the chance I would go to another one. It was exsplosive! I could really feel the power of Jesus there exspecially when we all sang Awsome God with the band. These two groups are the best. I thank God that they are here, and for them to keep on what they're doing in Christ. First and foremost, Newsboys are the best Christian rock band in the history of christian music itself. I've gone to 3 out of 4 of their concerts (one of them became the largest Christian contemporary concert in North America). I've met them once and have pictures to prove it and I am very proud to say I am a Newsboys Freak. I have at least 7 posters in my room (one is autographed), and a couple of clipping from magazines and newspapers. And I have a letter they wrote (well printed) to me after I wrote to tell them how much I love them. I know the words to every song on the Take me to your Leader CD, and I'm still learning the ones on the Step Up to the Microphone CD. I had a copy of their appearance on a show that doesn't come on until 1:00 in the morning but my sister accidentally recorded over it. These guys are down to earth, their music speaks Heavenly, their sound gives you a jolt of the Spirit! Talk about your Rock and Praise music. The new CD, Love, Liberty, Disco is fantastic! Every song is good. They mix up their style so that you hear a bit of all types of music. The first song , a little (clean) Tom Petty sound. 2nd one, of course, a Bee Gees type sound. One of them sounds a bit like a Run DMC style and still another has a sort of Eric Clapton ring to it. Oh don't get me wrong, they most definitely sound like the "Newsboys" and there is really no comparison as far as that is concerned. I think they just tried to please everyone with this CD. I hope they never let it go to their head like some Christian groups have. They have so much to offer and share. I like to turn them up and Praise the Lord! P.S. I wish they played around here more often. The last time I saw them, they were held up in N.Y. and were 3 hours late but well worth the wait. Hi! I just wanted to say the Newsboys are the most totally awesome group I have ever heard. I think it's so great that they have been around for like 10 years and are still so popular. I love the Newsboys Live: One Night In Pennsylvania video. It is so cool. Also their new song "Love, Liberty, Disco" is great. It has an awesome chorus. I like, live for the day I get to go to one of their concerts and hopefully meet them. Anyway I guess I just wrote because I have to gush to anyone and everyone about them. My family is sick of hearing about nothing but Newsboys.